Having an excellent English grammar is essential when you own a blog and you write all your content in English. English is not my primary language, and you can probably see that very easy if you are a native English speaker and you read my posts. I’m originally from Romania, and I’ve lived here my whole life. To be honest is not very easy for me to write in English since I don’t actively speak this language on a day-to-day basis. The language spoken in my country is the Romanian language, and I don’t have the chance to speak English very often here. Even though I write all the posts on my blog in English and I read a lot of things in English every day, I still often make grammatical mistakes or write phrases that might not have too much sense for a native English speaker. Romanian is a Latin language, and sometimes I have difficulties in finding the right alternative in English for specific words or phrases. Not being a native English speaker increases the time allocated for writing a blog post and it would surely take me much less time to write the posts in my primary language. Many non-native English speakers are discouraged to start a blog in English, but I’ve always tried to get over this barrier. I know my English is not perfect, and writing is clearly not my strong point, but I’m confident that these aspects will improve in time. The reason why I chose to write my in English is that having a blog in an international language will open you a lot more opportunities, as well as the possibility of getting more traffic. The disadvantages are that I spend more time writing the blog posts and that my posts may contain bad grammar or phrases that may not have too much sense for some of the native English readers. What helps me with the English grammar? One and a half years ago, my brother recommended me a tool that could help me improve my English grammar and I use this software ever since. This tool is called Grammarly. Grammarly is an English language writing-improvement service developed by Grammarly, Inc., and it was first launched in 2009. Grammarly has two versions: a free and a premium version (paid subscription). The free version it’s excellent, but the paid version worth all the money, especially if you are like me, a blogger who’s native language is not English. I used the free version for some time, but since the paid one had some very useful additional features, I’ve upgraded to the premium plan. This is my second year of paid subscription. I pay for a full year since you get the best price when you pay annually. Ever since I started using Grammarly, my posts contain fewer grammatical mistakes and the time spent on writing a post has drastically dropped. Grammarly has a list of powerful features that will help you write better content and speed up your workflow. 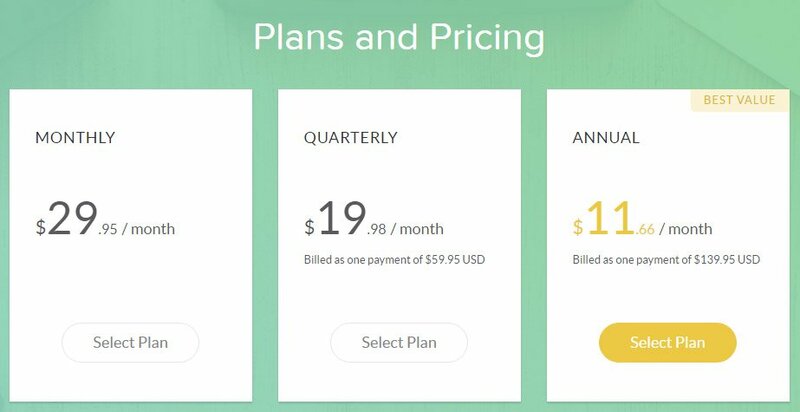 Some of the features are only available with the premium plan, but I still find the free version to be extremely helpful. You can even set Grammarly to correct American, British, Australian, or Canadian English. Below are some of the features of Grammarly. Grammarly highlights your typing errors and will suggest you the correct form of the misspelled word. The correction process is straightforward, and once you see the highlighted word, you just need to move the mouse cursor over it and click the correct suggestion given by Grammarly. Very often I tend to add too many commas in a phrase, or I don’t add one where it’s necessary. I also tend to make my phrases very long and hard to read sometimes. Fortunately, Grammarly is always watching and notifies me of my mistakes. When English is not your first language, it will often happen to use a verb tense that it’s not suitable for the way you have started a phrase. Again, Grammarly will quickly notice that and suggests you the correct tense for the verb. In Grammarly’s editor, double-click on the word you want to find a synonym for and Grammarly will give you a list of words with similar meanings. If you repeat a word two or more times in a phrase, the software will indicate this issue. You can then reformulate the sentence or use synonyms. Another very helpful feature of Grammarly is that will explain to you what is wrong with your phrase. Under every highlighted error, there is a short explanation why your writing is not correct. This way you can improve your grammar and avoid doing the same mistake again. When your phrases become too long, Grammarly will suggest you split them into multiple sentences. 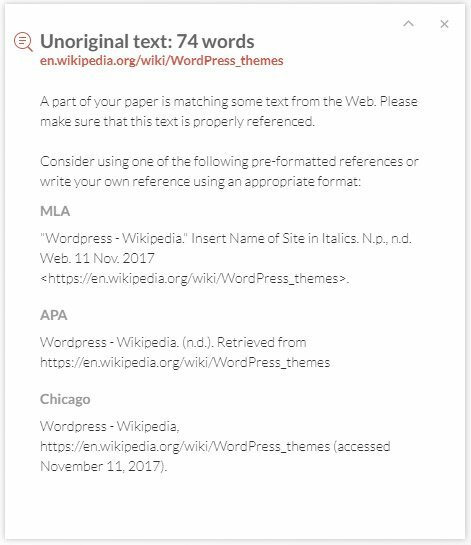 Grammarly also has a feature that allows you to check a specific text for plagiarism from more than 8 billion of web pages. Grammarly has a free and a premium version. The free version allows you to correct critical grammar and spelling checks, while the paid version has much more options. 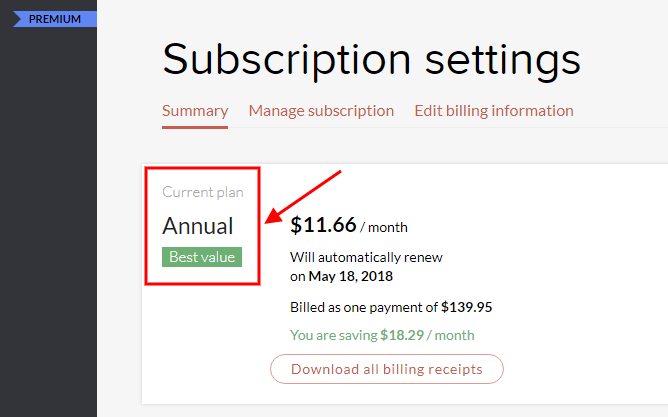 If you decide to upgrade to the premium plan, I’d recommend you to pay yearly. This way, you save the most money. You have the options of paying monthly, quarterly or annually. Note that the prices from the screenshot above are accurate at the time I write this post (November 11, 2017). Grammarly might change these at any time. I have a paid subscription for about a year and a half, and I’m delighted with what Grammarly’s premium plan has to offer. Still, if you only need basic proofreading and limited grammar checks, just try the free version. Grammarly is available in the shape of three different apps. If you are using Google Chrome as your web browser, you can use Grammarly as a browser extension. After you install the extension, Grammarly will be automatically added to the input forms on every website you visit. If you make grammar mistakes, Grammarly will notify you immediately. When Grammarly is active, you should see a tiny icon in the bottom-right side of the form you’re writing in. When the icon is green, it means that Grammarly considers your writing to be correct. If Grammarly has some suggestions for improving your writing, the icon will have a yellow dot at the top. When some critical writing mistakes are found, the icon will turn to red and will display the number of errors detected. If you don’t want Grammarly installed directly to your web browser or if you don’t use Google Chrome, you can install the Windows app. Grammarly will be then installed as a Windows app. You can also access the same editor online in your Grammary’s account, without to have to install the Windows application. After you open the App, you will be required to log in to your grammarly.com account. Once inside, you can create new documents or import a document to be checked with Grammarly. 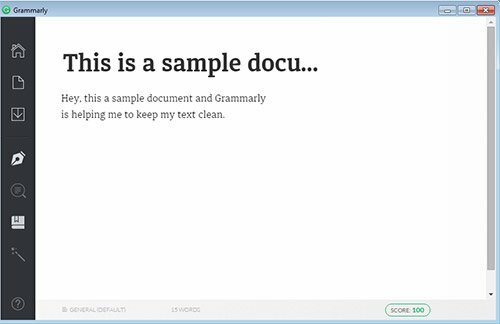 If you have the Microsoft Office pack installed, you can add Grammarly’s functionality to Microsoft Word. Even though Microsoft Word has a built-in spell checker, Grammarly is much powerful. Grammarly is truly the world’s best proofreading and writing improvement tool. This software is helping me a lot to write content with fewer grammatical mistakes, and it also reduces my working time considerably. I find Grammarly to be an excellent tool for the people whose English is not their first language. It’s ideal for bloggers, book authors and for anyone who writes content in English. It’s also perfect for the native English speakers as “the second pair of eyes,” or for helping you convert your work in one of Grammarly’s supported English dialects. Still, you have to know that even if Grammarly has some very handy features for improving your English grammar, it cannot do miracles. That means that you still need to have a solid English understanding and a basic grammatical knowledge. Even though Grammarly is a powerful software, there are still isolated situations when the software doesn’t recognize some expressions, can’t spot mistakes or gives you a poor suggestion. You need to understand that Grammarly still cannot replace the human decision because you as a person have a better understanding of the sense of words and phrases. I find Grammarly to be the best tool of its kind and it’s continuously improved. If I’d have to pay someone to proofread all my blog posts, that would cost me a fortune. This fantastic software not only helps me to save money but it also assists me to improve my English by offering explanations for every mistake I make. If you don’t know if Grammarly can help you, just install the free version and give it a try. You can always update to the premium version if you find the app useful.